Cranberry plant is an evergreen small, dwarf shrub. There are two types of these herbs one European and one North American. It contains high levels of vitamin A, vitamin B, vitamin C, phosphorus, magnesium, potassium and calcium. It can be eaten as fresh fruit or dried, and the most famous product is the natural cranberries juice. Besides juice from this plant syrup, jam, wine and tea are also made. It is an excellent antioxidant. This juice inhibits the growth and development of bacteria, but the best effect it has is the prevention of urinary tract infections. Its healing powers do not end here. Cranberry is considered one of the healthiest plants because of the large number of things it has a positive influence on, whether it be eaten as fresh fruit or drunk like a tea and juice. Cranberry juice has a beneficial effect on the health of the whole body, improves immunity and relieve stress. Research shows that the cranberry as a medicine is excellent in the prevention of urinary tract infections, because the ingredients in it prevent unpleasant bacteria E. coli from attaching to the cells of the bladder and cause problems. As a prevention it is especially recommended for people who are prone to urinary infections. Ulcer is caused by a helicobacter because it damages the mucous membranes. Due to its extremely strong antibacterial effect, natural cranberry juice is an excellent prevention for this disease, as they prevent the propagation of unpleasant bacteria. For this reason, doctors recommend drinking this juice. It is good for cleansing the liver. This herb raises the levels of good cholesterol. Homemade cranberry juice without sugar can help prevent cardiovascular diseases, because it is rich in flavonoids, which are an antioxidant. The colour of the berry comes from the large amounts of anthocyanins, which have antioxidant and anti-inflammatory effects. And this ingredient in cranberry has application in the prevention of cardiovascular diseases. Since the composition is similar to aspirin, it reduces the risk of blood clotting. What is a cranberry juice without sugar good for? Because of its good antibacterial effect this plant and its juice are excellent for prevention of diseases of the teeth and inflamed gums. Studies have shown that it has a good effect on respiratory infections, as well as sore throat and the common cold. Because it is rich in organic acids it is good for weight loss. Because of the acidity of cranberry juice it is excellent in the creation and prevention of kidney stones, but only in dosed levels. Cranberry is rich in vitamin C, which is essential for the production of collagen and absorption of iron. The lack of this precious vitamin causes scurvy, and as a prevention natural squeezed cranberry juice or fresh and dried fruits are recommended. Another ingredient of this plant is manganese, which prevents changes in the bones and serious problems in the metabolism. Scientists from the USDA (United States Department of Agriculture) claim that phytonutrients and antioxidants from cranberries are extremely important for the protection of the problems, which come with age such as memory loss, poor memory and concentration. Also these ingredients are excellent against free radicals and have a positive effect on the condition of our skin. For cranberry juice you will need a blender. It is recommended that you keep the juice in the glass bottles that were previously cleaned and sterilized. Also, you will need a lemon squeezer and gauze for filtering. How to prepare this beverage? Wash cranberries and grind them in a blender with 100 ml of water. To this mixture add lemon juice and the rest water. When you mix everything the foam will appear, it is necessary to remove the foam, cover the bowl and leave it to cool. It is not recommended to put it in the fridge. Leave it to stand for 24 hours. After this time, strain the cranberry juice through a wet gauze and cook over medium heat for a quarter of an hour. Foam will appear constantly, as you remove it. Pour the hot juice in hot bottles, seal and wrap them in a blanket. Allow it to stand for 24 hours again. After that, the bottles with the juice put in a dark place. When you start using the juice keep it in the refrigerator. Tea has an equally good effect and prevents inflammation. For cranberry tea you need a cranberry fruit fresh or dried - it does not matter. For a cup of tea you need one teaspoon of fruit and pour it with boiling water, cover the bowl and let it sit for ten minutes. Before drinking the tea filter it and sweeten it, you can add honey. Apart from the fruit, this hot drink can be made from the leaves of cranberries. Two teaspoons of dried leaves pour with 2 dl of boiling water. Leave it for a good 15 minutes, stir and filter. It is recommended that you drink up to three cups of tea a day, but not longer than three weeks. Cranberry tea is a very effective natural remedy in the case of urinary tract infections, especially when the latter is caused by the bacterium E. coli. During the infection, but also after it, it is very useful to drink the natural cranberry juice, which significantly reduces the risk of recurrence of persistent infections. Boil 30 grams of cranberries in 0.5 l of water until half of the liquid has evaporated. Sweeten it with honey to taste and drink several times a day, until the symptoms have disappeared. We have already noted that cranberry juice is good for weight loss, of course if it is properly dosed and prepared without added sugar. It is important to say that in 100 grams of fresh fruit there is only 15 calories, making them ideal for weight loss, but the fresh fruit should not be mixed with dried cranberries because they have four times more calories in the same amount. All famous red berries are great antioxidants and such is the case with cranberries. They are fantastic fighters against various diseases. They are very useful for the health of the kidneys, because thanks to them, the kidneys, release easier uric acid. 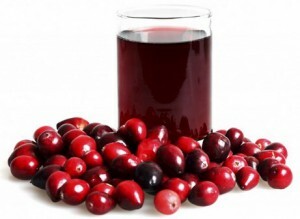 Cranberry as a medicine is mentioned in the traditional medicine for the treatment of bladder, it contains precious quinine, thanks to whom it successfully ejects urea. Similar effect of natural cranberry juice is accomplished by powerful blueberries and red grapes. Cranberry is very healthy. Native Americans knew that and was a part of their folk medicine. However it is important to note that with cranberries you should never exaggerate, because it can cause diarrhoea. Also, if you drink more than a litre of juice a day it increases the risk of the occurrence of kidney stones. It is best to drink cranberry juice 3 dl to half a litre a day, because its positive effects are the most efficient then. Is cranberry allowed during pregnancy? If you take any medication against coagulation be sure to consult a doctor regarding the intake of cranberry, because cranberry is also an anticoagulant. Cranberry in composition is very similar to aspirin, so it is not recommended to those who are allergic to this medication. If you have a stone in the kidney, drink this juice (300 ml to 500 ml per day), because in this quantity it has a healing effect. Larger quantities are not recommended, but it is always best to consult with a physician preferably an urologist. Cranberry juice can freely be used by pregnant or nursing women without any fear of side effects. The important thing is not to overdo it as we already mentioned. What is the price of cranberry juice, and where to buy it? The price of the organic juice, which is obtained from wild cranberry ranges from 7$ to 20$, depending on the manufacturer. Today, syrup and cranberry juice are available in all-fitted herbal pharmacies, as well as in the internet stores, through which you can purchase your natural antioxidant online. Always timely inquire about the product, as well as about the store. The offer is good and organic juice is increasingly in demand.